Did you know that 47% of adults are affected by gum disease? Gum disease or periodontal disease is an infection of the gums, teeth, and the bone that supports the teeth. It is caused by a growing colony of living bacteria in your mouth known as plaque. 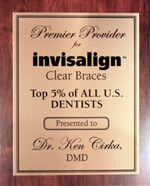 Plaque produces toxins under your gums causing bone loss and is the greatest cause of tooth loss in adults. In the beginning of periodontal disease there is little, if any pain so you may not even know that you have it. The early stages you may notice some occasional bleeding along with some puffiness, but may not think anything of it. If your periodontal disease is left untreated the results may lead to extensive jaw destruction and possible tooth loss. Treating periodontal disease in the early stages can be treated and controlled. Why can’t I just brush my teeth to take care of the problem? Deep pockets exist around your teeth that require deeper than normal scaling. There’s only one way to remove this deep build up and that is through the use of small scaling devices used by our great hygienists. Even if you floss you cannot reach the deep pockets. I brush my teeth; how can this happen? Any food debris left on your teeth for more than 24 hours will turn into hard material called tartar or calculus that can only be removed by a hygienist. This usually forms between the teeth, so if you have any food particles that remain after brushing and you have not flossed, it becomes hard and difficult to remove. Why have I never heard this from my dentist or hygienist before? We spend time with each patient and also are very educated on periodontal disease. By carefully examining the X-Rays and taking measurements around the teeth, we are able to see the destruction, often times well before other dental offices. By catching the problem early, we increase the chance for you to keep your teeth strong and healthy for the rest of your life. You’re probably wondering now if you have gum disease and how is it treated? Well, at your first visit, one of our great hygienist will remove all the build-up above the gum line and you will begin to use a prescription gum and mouth rinse daily. During your second visit we use a gel that thoroughly numbs your gums without a needle. For some patients, scaling and root planning can cause discomfort, so we prevent that with a local anesthetic used to numb the portion of your mouth that is being worked on. 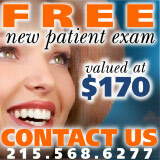 You will feel 100% comfortable with the treatment in our office. At your third visit, 2-4 weeks later we clean and polish your teeth again, checking to see if you healed as predicted. If so, we will see you every 3 months for a periodontal cleaning to monitor and maintain the health of your teeth and gums. Give us a call today to schedule your routine cleaning and check-up with our astounding staff! 215-568-6222.